The tide had turned, and I had been sitting on the stool in my little hide for about three hours. 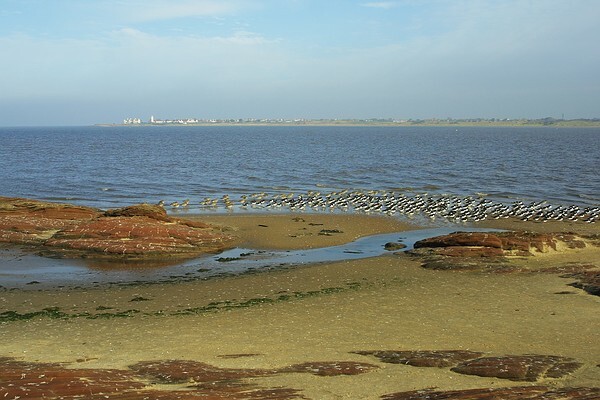 The birds around me - mostly oystercatcher, curlew and cormorant - dozed in the sun, and my legs were becoming stiff and in need of a stretch and change of position. Suddenly my eye leapt to the sudden movement - a ripple of anxiety spread through the oystercatchers as a swift brown bird flew over them. Talons! - a bird of prey - there was something in its talons! I desperately tried to get it in my viewfinder, and managed to get off a shot as it passed in front of the hide. I switched to the side window of the hide and, to my delight, saw it land in the grass a few yards away. Standing above its prey, the predator glared around, wanting assurance of its safety while it fed. Hardly daring to breathe, I detached the camera from the tripod and slowly moved it to the side window. With minute care, I lifted the camouflage netting with the lens hood, and put the viewfinder to my eye. A black, baleful eye - not a sparrowhawk. I pressed the button, and the bird continued to ignore the hide and scan its surroundings elsewhere. I extended the zoom lens to maximum length, steadying it on the material below the window. Not a kestrel - pressed the button again. The bird turned its head and looked towards me - I felt its inspection through the camera lens. So small - must be a merlin. I pressed the button again, and it took off, taking its prey with it. 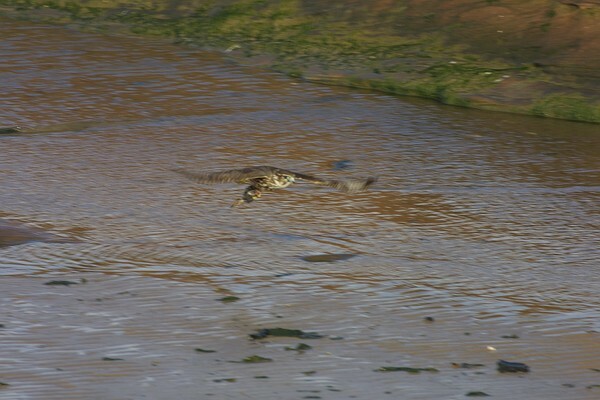 As I relaxed, moving the camera back to the front window, the merlin reappeared, landing on the sand in front of me. I got off another shot as it started to feed, but then it seemed to remember that my hide was an object of suspicion and flew off again, this time not to return. 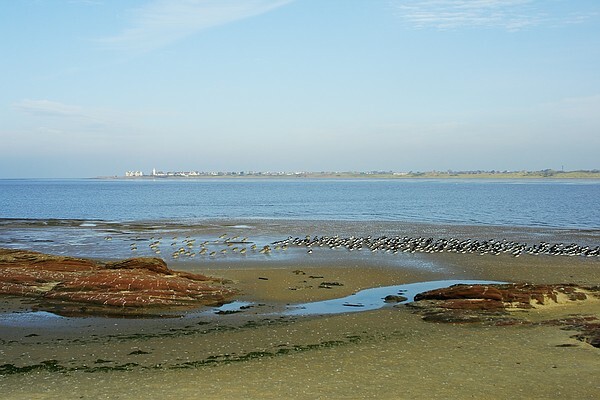 The water retreated before me, and the oystercatchers and curlews spread out over the sand. I found later (thank you, Paul Tout!) that my merlin was a juvenile, born 2003, as evidenced by the light brown blotches on its wings. 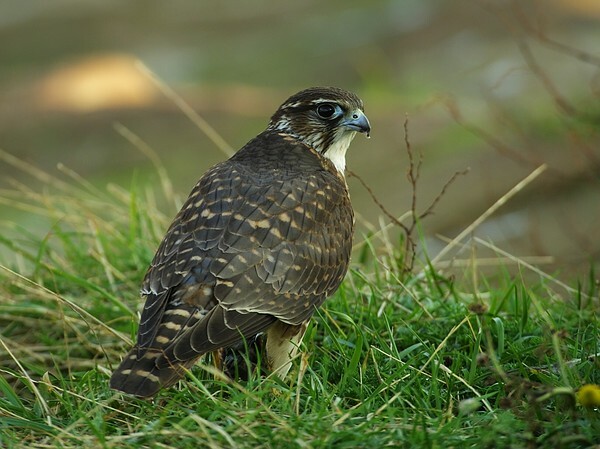 I also noted from Richard Smith's website - www.deeestuary.freeserve.co.uk - that two merlins had been seen on Hilbre Island the following day. 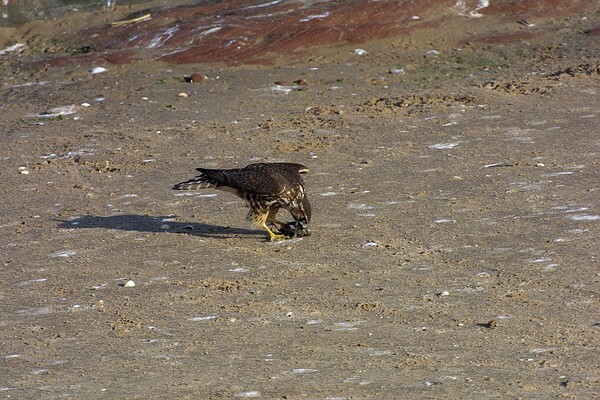 Perhaps young merlin had caught its prey (rock pipit?) on Hilbre or Middle Eye and had flown with it to Little Eye to consume it unmolested by parents or siblings.